I've been waiting to get this this big bruiser for weeks; it's Mumm-Ra, the Ever-Living! 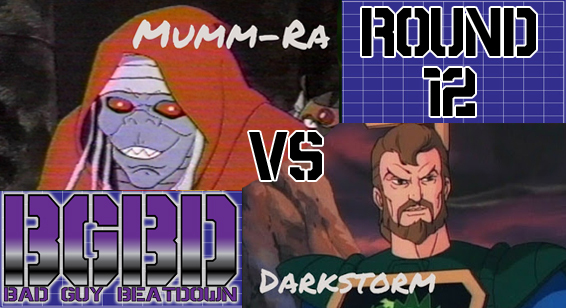 The 1000-year-old mummy has come to the arena, but what all can Mumm-Ra actually do? One thing we need to figure out is what powers are his to command, and what does he depend on the Spirits of Evil to do for him. Who are the Spirits of Evil, you ask? Are they anything like the Specters of Darkness from Wildfire? I mean, pretty much, except they're not stuck in an urn. 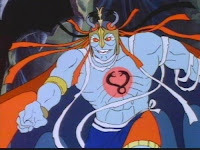 The Spirits of Evil are what Mumm-Ra calls upon to change from his decrepit form to that big bruiser. Mumm-Ra can call on them to do some other stuff, like seeing visions in his scrying pool, but those powers are mostly limited to his Black Pyramid. Luckily, his transformation isn't limited to just the pyramid, as he can change forms anywhere he wants, as long as he can speak the incantation "Ancient Spirits of Evil, transform this decayed form to Mumm-Ra, the Ever-Living!" He's also shown to change into other forms, including a fake Thundercat name Pumm-ra (how did Lion-o and his friends not see through that?) and a beautiful maiden. So, we can see that Mumm-Ra can change shape, but what else can he do? In either form, Mumm-Ra is able to fly, teleport (usually to escape), and shoot lightning or energy beams from his hands. In his larger form, he's incredibly strong and fast, able to hold his own against Lion-o. In his first fight against Lion-o (played without any music for some reason which made it kinda boring), a tree fell on him and he blocked it with his forearm, even if the tree hit hard enough to break in half. He threw half of the tree at Lion-o and blasted another tree in half with his energy beams. Unfortunately, this is the best example of Mumm-Ra's powers. He's one of the unlucky villains in this tournament that don't appear in all thirteen permitted episodes - in fact, he's only in five of them! There's a three episode stretch where he didn't show up at all, even though the Mutants do. But that's okay, because he does show a few other abilities. In two episodes he summons insectoid allies, and since one of them is outside of the Black Pyramid, I'll allow them. The first time he summons a swarm of locusts, and in the second, he calls upon a giant moth. I mean, it doesn't really do much besides fly around and chase Panthro, but it's scary enough, and it shows what the Spirits of Evil are capable of. Mumm-Ra does have a few weaknesses, though. As a decrepit, 1000-year-old mummy, his stores of energy are low - he can only use so much power or stay in the ever-living form for so longer before he needs to return to his sarcophagus to recharge. He's also shown once to be terrified of his reflection, forced to return to his withered form and seek refuge in the pyramid again. I thought maybe this was a one time thing, since the reflection only shows up in Lion-o's glove and it later is shown to reflect lasers, but it's a documented weakness, so I'll keep it. I forgot about this in the last few respect posts, but I'm going to list his abilities and weaknesses again for clarity. Weaknesses: limited time and energy before he needs to recharge, afraid of his reflection, some powers are only available to him within the Black Pyramid.